How to identify asbestos-containing Kentile or KenFlex floor tiles: here we provide a photo guide to Kentile asphalt-asbestos flooring & Kentile vinyl asbestos floor tile identification photographs, a list of product names, styles, colors, and vinyl-asbestos floor patterns, and colors for asbestos-containing floor tile products - flooring materials that are reported to or have been confirmed to contain asbestos in asbestos fiber or asbestos powder-filler form. We report on both asbestos-containing Kentile flooring and later Kentiles tested and found asbestos-free. 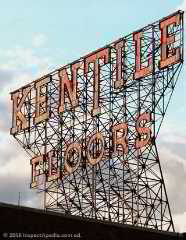 Asbestos-containing floor tiles were produced by Kentile Floors, a Brooklyn NY company that filed bankruptcy in 1992. 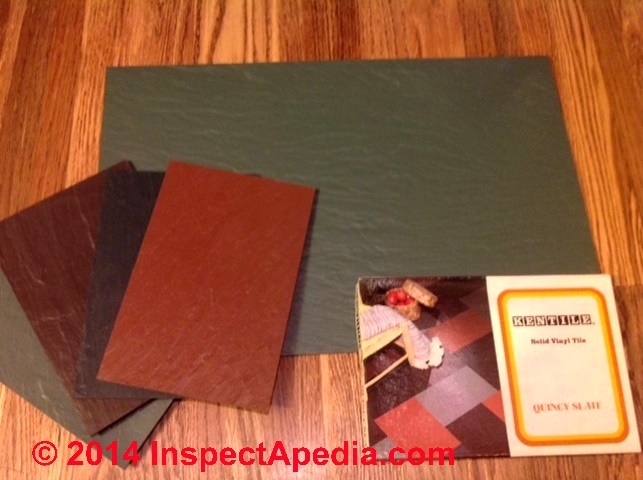 (founder Arthur Kennedy 1898) (at least) as 9" x 9" resilient flooring in a variety of patterns (left) and shades as we illustrate in photographs in this article. KENTILE LAB REPORT of No Asbestos? 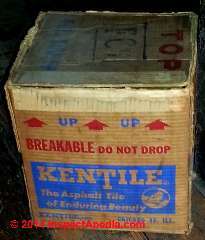 The Kentile corporation, founded in 1989 in Brooklyn, New York by Arthur Kennedy, producd asbestos-containing floor tiles, some with a high percentage (estimated by some sources as 25%) of asbestos. 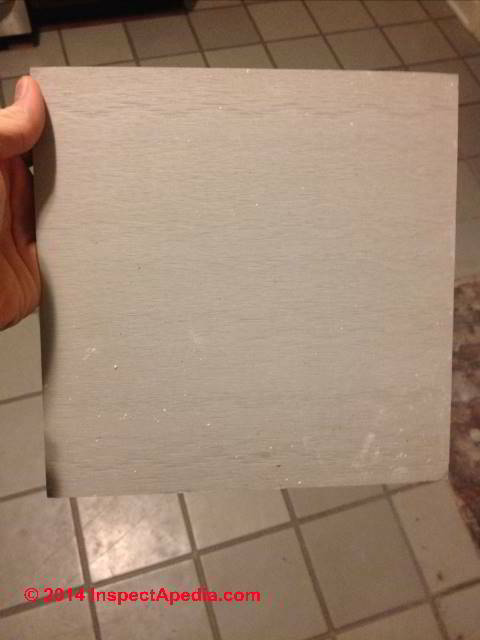 As with virtually all of the older asphalt and then vinyl-based floor tile manufacturers, Kentitle's early floor tiles were an asphaalt-based product in which asbesstos was used in both fiber form (for reinforcement) and in fine powder form (as a filler) in the floor tile composition. 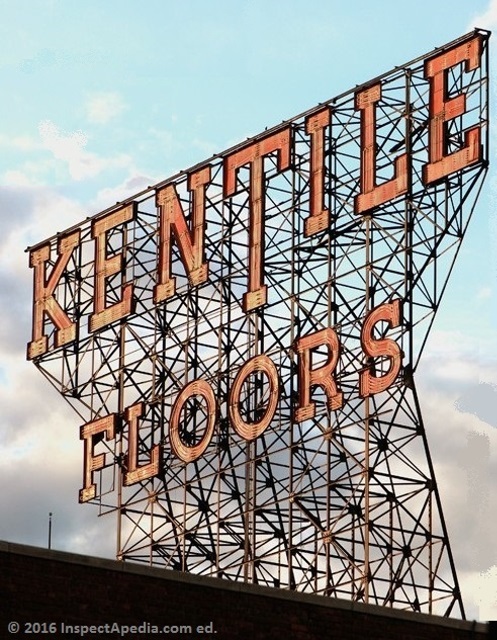 The Kentile company advertised flooring products both for residential and for business or commercial installations. The Kentile company filed for bankruptcy in 1992, almost certainly in reaponse to the financial burden of asbestos-related litigation, and emerged reogranized in 1998. Kentile was also named in further class action litigation in 2006. The company was not successful in an attempt to form an asbestos trust to respond to litigation. 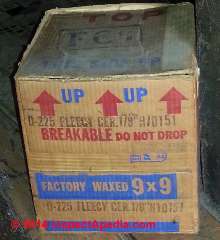 Watch out: as we read in InspectApedia reports on wood-fiber sheathing products and some ceiling tile products, even products that did not themselves deliberately contain asbestos were on occasionally contamined by asbestos that was present at the same manfuacturing facility or site where other asbestos-containing products were produced. Watch out: Unless you have an asbestos content test from a certified asbestos test-lab who used approved asbestos detection procedures and that demonstrates that your flooring does not contain asbestos, it would be prudent to treat the flooring as presumed to contain asbestos. This does not mean that panic nor great expense are necessarily appropriate. Asbestos is safe and legal to remain in homes or public buildings as long as the asbestos materials are in good condition and the asbestos can not be released into the air. Our photo (left) illustrates Kentile flooring from a New Jersey home built in 1941, thanks to reader J.S. 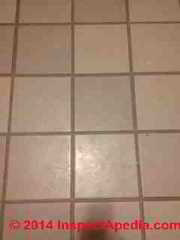 who noticed Kentile markings on the back of this flooring. We discuss his floor and include more photographs in the FAQs section at the end of this article. 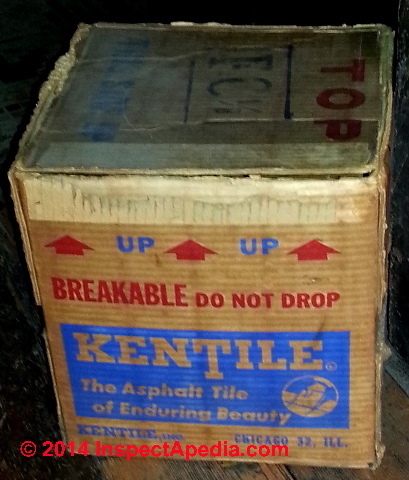 In 1949 Kentile was producing asphalt-based floor tiles. 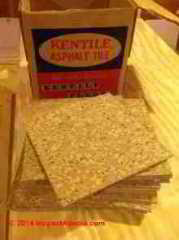 In the early 1950's, Kentile produced mostly asphalt-based floor tiles but also some cork-based floor tiles. 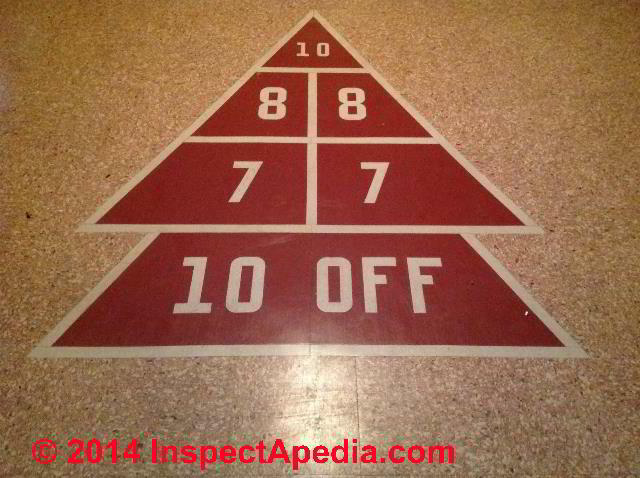 In 1951 a 8' x 9' room floor cost $10.95 when it was consumer-installed. 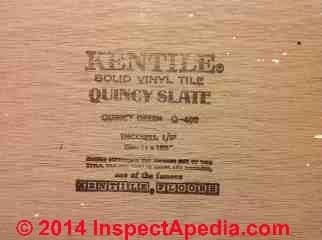 In 1969 Kentile was producing vinyl sheet flooring. 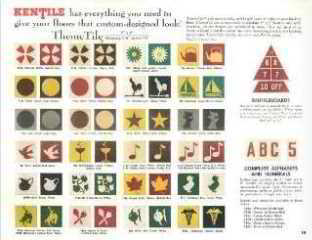 Some of Kentile's 26 colors/patterns included Breccia, Carnival (multi-color), Dog Tooth, Fleecy Cerulean, Gaiety, Genoa Green, Greek Skyros, Lamartine, Ovation, Toledo Red, Verde Antique, regular pattern, Marbelized, and die-cut theme tiles and solid color feature strips. At above left our illustration shows green and beige Kentile floor patterns from 1958. Kentile's sign, along the Gowanus Canal (Brooklyn New York, ca 1949) has been considered an important landmark in its own right. 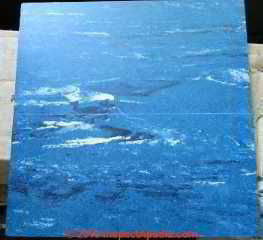 In Canada Kentile flooring was distributed by T. Eaton Co., Ltd. The company filed bankruptcy in 1992, ceasing operations in 1995. 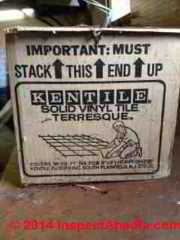 When did Kentile Stop Making Asbestos-containing Floor Tiles? Opinion: from literature review and citations throughout this article series (also see REFERENCES) it appears that the company continued to produce asphalt-containing flooring at least through 1986 and possibly later. Unless supported by an asbestos-free lab test from a certified asbestos testing lab (ASBESTOS TESTING LAB LIST) it would be prudent to treat all asphalt and vinyl flooring products from Kentile as asbestos-containing material. 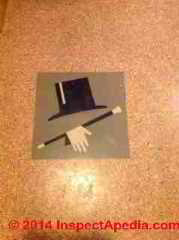 Depending on its location and condition it may of course be safest to leave such flooring in place. 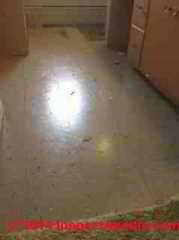 See ASBESTOS FLOORING LEFT IN PLACE. [Click to enlarge any image] Above, Kentile 9x9" commercial floor tiles. 1" x 18" edging (with one edge tapered). For Kentile flooring the standard thicknesses are 1/8" and 3/16" (some sources cite unconfirmed thicknesses of 1/16", 3/32", and also in 0.08 gauge). 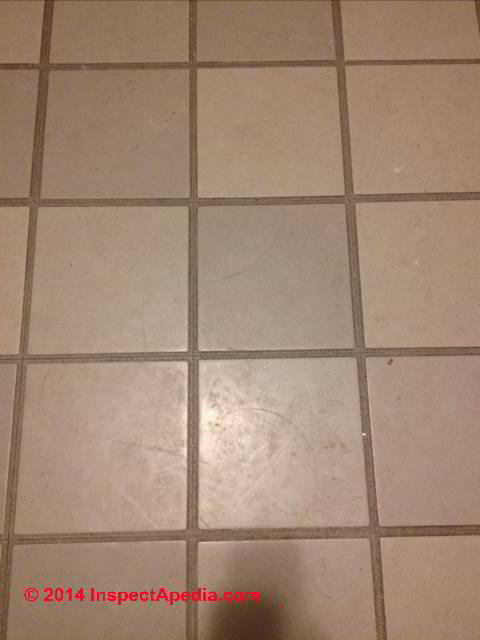 If the floor tile is thicker than 1/16", particularly, 1/8" or more, we suspect you're looking at an asphalt based tile, rather than a later vinyl-asbestos floor tile. 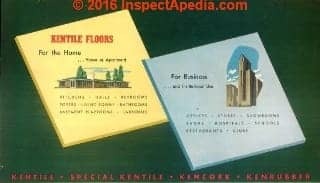 The Kentile flooring idenfication photos and pattern examples shown here are culled from magazine advertisements and Kentile flooring catalogs from the 1950's. 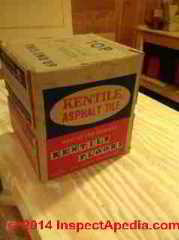 Below we also include actual Kentile floor tile photographs and images of Kentile packaging contributed by our readers. Kentile (asphalt floor tiles orf vinyl-asbestos floor tiles) - Residential flooring line. Some Kentile asphalt-asbestos flooring was also advertised as "styrene reinforced"
Watch out: in addition to true cork flooring (that may not contain asbestos) Kentile and other flooring companies produced vinyl-asbestos floor tiles in a cork pattern that did contain asbestos. 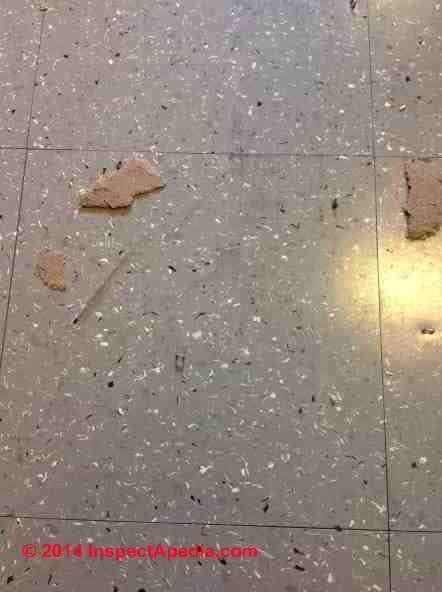 Don't confuse true cork flooring (CORK FLOORING) with cork pattern floor tiles made of viny and containing asbestos. Kenrubber (rubber floor tiles) (at least) as 9" x 9" resilient flooring including patterns and in 23 bold colors (1949) and in 26 colors (1952). Kentile slate tile patterns: The company's tile patterns also included a slate look-alike asphalt-asbestos flooring product. 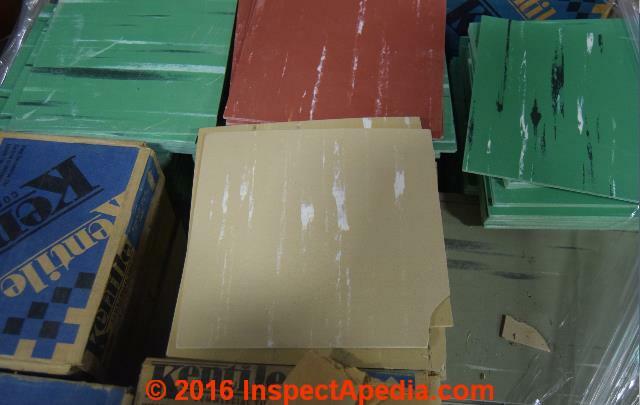 In addition to the known Kentile-brand vinyl asbestos floor tiles shown here, some of which are shown at ASBESTOS FLOOR TILE IDENTIFICATION PHOTOS 1949-1959 - asbestos may be in Kentile products produced through 1986. 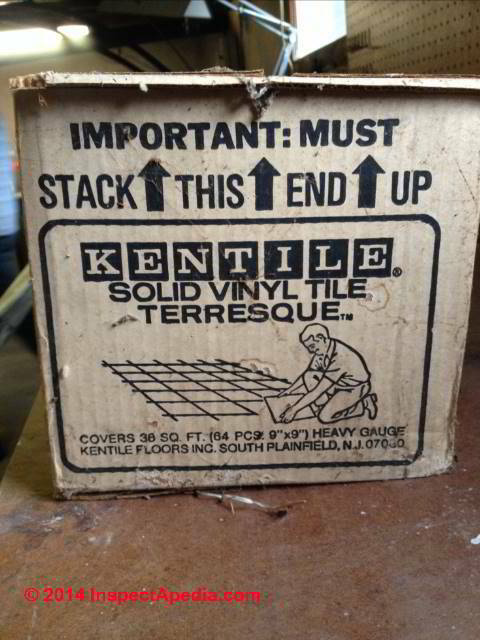 Photos here illustrate Kentile floor tile packaging label data. Click any image to see an enlarged, detailed version. 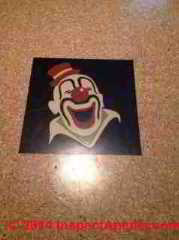 So don't assume that only "vinyl asbestos floor tiles" include asbestos. According to Rosato, asbestos filler (powder) and fibers were used in asphalt based products too. 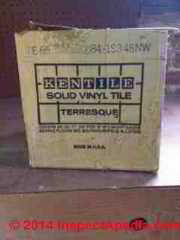 Above, Kentile solid vinyl "terresque" flooring reported by one reader whose (possibly-questionable) lab test did not detect asbestos. See KENTILE LAB REPORT of No Asbestos? Above & bleow, Kentile packaging for # 551 Buckskin Marbleized 1H122C flooring installed in a South Dakota home and dating from 1978 or 1979. Here is all the info & pics of the box along with a pics of the tile. They also show the tiles in place along with a new tile. I would like to know if these tiles contain asbestos, you would think with all the info we have that there would be on a list if some kind. 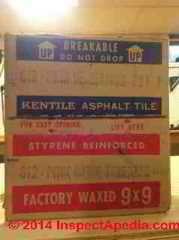 Below, Kentile "Factory-Waxed" floor tile packaging. 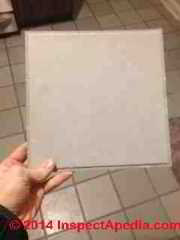 I purchased a home that was built in the 1970's and recently had water damage and the insurance adjuster asked me to remove the tile so that the flooring underneath could dry. 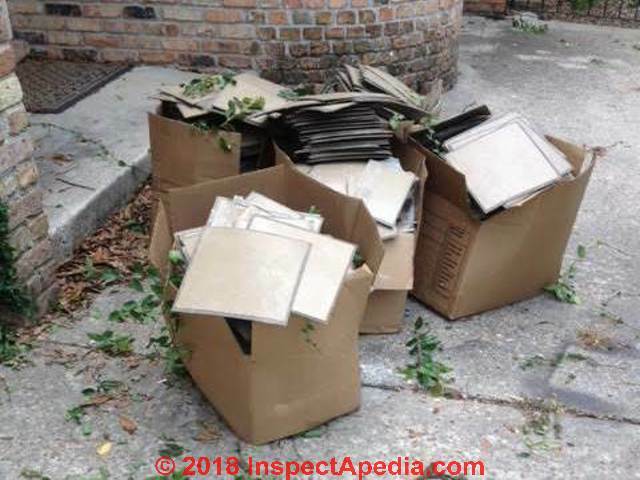 Your photo shows a bunch of what looks like vinyl tiles in boxes outdoors; from the photo I'm doubtful anyone could or even should try to identify exactly what tile this is, nor assert whether the tile in the photo (or other unseen flooring in your house) has asbestos or not. For a floor that is in place, intact, and is not being ground up or smashed about by demolition the level of risk is probably below the limits of detection. If you search InspectApedia.com for "asbestos floor tile hazard reduction" you'll see expert advice on what to do to minimize the hazard from asbestos containing floor tiles or PACM. We recently bought a home with Kentile asphalt tiles in the basement and bathrooms (grey and pink orchid). The basement is in good condition and is rather special as it has large, decorative die cut squares (a clown, a hand of cards, a magician's hat, etc) and also an inlaid shuffle board court. 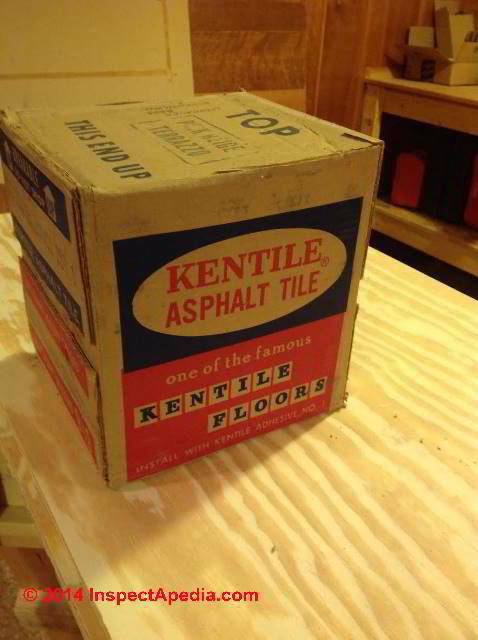 Here is the original Kentile "asphalt" tile flooring packaging box [shown below]. 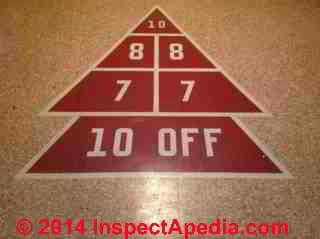 The product is labeled as Kentile Asphalt Tile, Styrene Reinforced, Factory Waxed, 9x9" Kentile Floors. 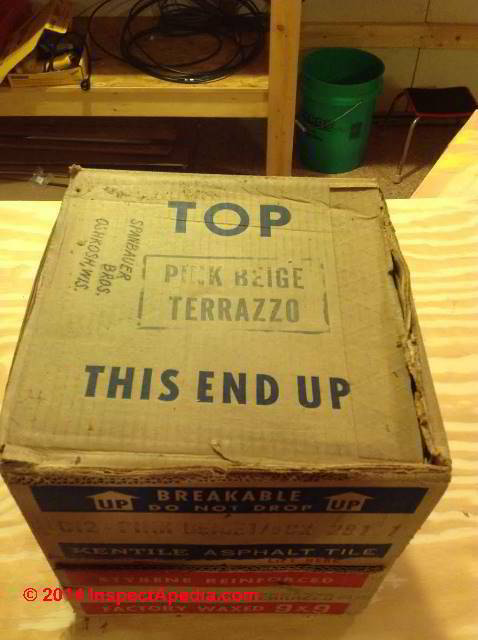 The tile pattern (shown below) in these boxes was Kentile's Terazzo Beige and Kentile's Cork pattern (second photo pair, below right). The following Kentile theme tiles are nice exmaples of die-cut Kentiles. Here are Kentile die cut accent tiles installed in the basement. 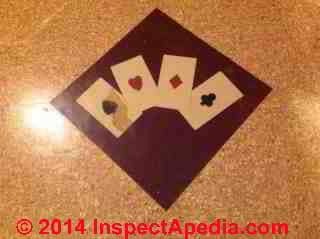 And two more popular die cut Kentile patterns from the same building's basement showing the playing card "Aces" pattern below.
. The toilet never seemed to sit square on the this floor and so we were going to pull up the flooring because we thought the subfloor might be soggy. 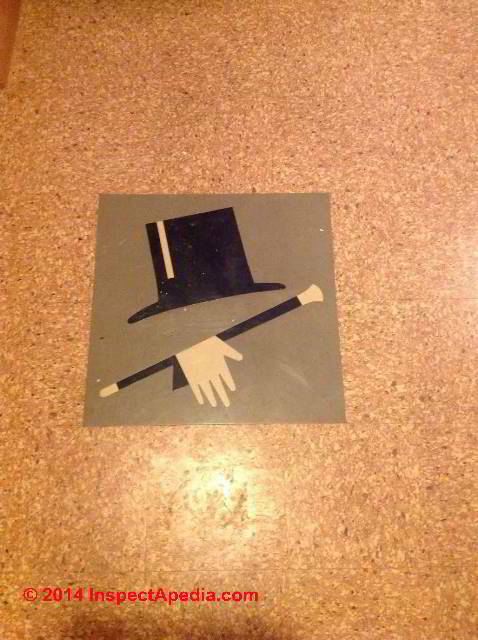 We pulled up a layer of sheet vinyl on top of a layer of MDF and these tiles were underneath. 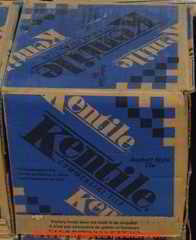 There you will find more photographs of Kentile flooring patterns and packaging. I went and got the tiles and the adhesive tested in a lab and found out that this particular version of Kentile has no trace of asbestos. Apparently about 5% of 9x9 tiles were made without it. It must have been made between 1986 and 1992 when Kentile stopped using asbestos. I am attaching some photos to this email in the hope they can be of help to others for future reference. Thanks again for your help. - J.G. Thanks so much for this follow-up John. It is very important, particularly since my research had not previously been able to confirm the non-asbestos claim. I will be sure to add this data to our library. If you want to be identified I'll be glad to cite you as a contributor, or you can remain anonymous - which is our default mode for readers. It would be most helpful if you could email me PDF copies of the asbestos test lab reports. I want to be able to defend this assertion. I will of course also in that data keep your information private. Moderator follow-up: the lab used to perform the flooring tests submitted by this reader was not a listed, approved asbestos testing laboratory. See ASBESTOS TESTING LAB LIST to find federal, state or provincially-certified asbestos testing laboratories. Still the flooring tested might be asbestos-free. Continue reading at KENTILE FLOOR COLORS & PATTERNS KEY or select a topic from closely-related articles below, or see our complete INDEX to RELATED ARTICLES below. Also see FLOOR TILE HISTORY & INGREDIENTS for a discussion of the ingredients and production of asbestos-containing flooring. Or see this detailed photo guide to individual vinyl-asbestos floor tile patterns, brands, sizes, and years of manufacture, see ASBESTOS FLOOR TILE IDENTIFICATION PHOTOS 1949-1959. 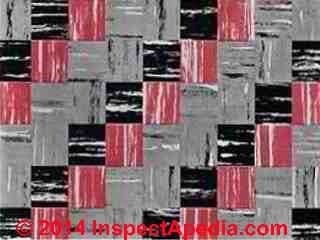 KENTILE KENFLEX ASBESTOS FLOOR TILE GUIDE at InspectApedia.com - online encyclopedia of building & environmental inspection, testing, diagnosis, repair, & problem prevention advice. Thanks to reader Matt Abel Design Services Department, Strongwood Log Home Company, 711 Shadow Road, Waupaca WI 54981, Office (715) 258-4818, Toll Free (866) 258-4818, www.gostrongwood.com "Begin your journey home.." for vinyl asbestos floor photos, October 2010. 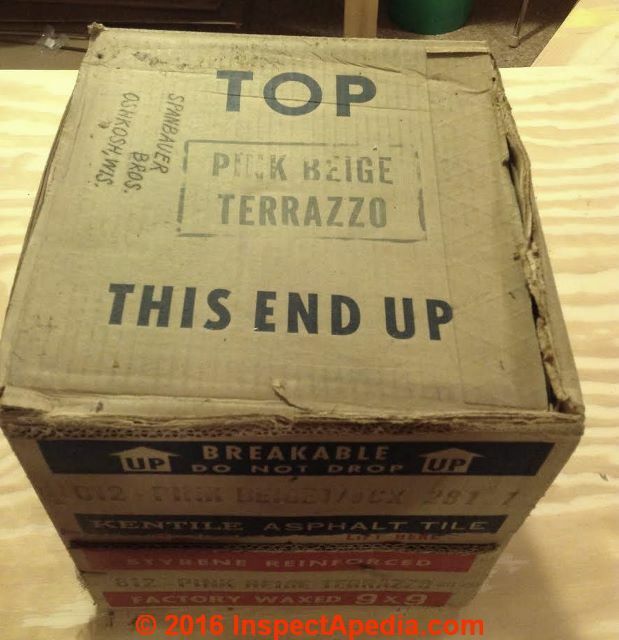 Thanks to reader Meryl Silvers for hexagonal floor tile photos showing a possilbe Kentile product that contained asbestos. October 2010. Vinyl Asbestos Floor Tile Composition Description - websearch 01/21/2011, various.